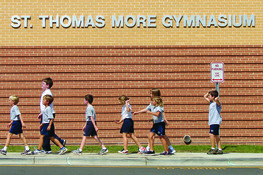 St. Thomas More will once again partipate in Science Olympiad as an after school program. Science Olympiad gives students the opportunity to compete with other area students using their skills in problem solving, creative thinking, design and engineering, as well as their knowledge of various topics. As a team, students construct devices to meet specific criteria, and work together to prepare for different academic challenges.